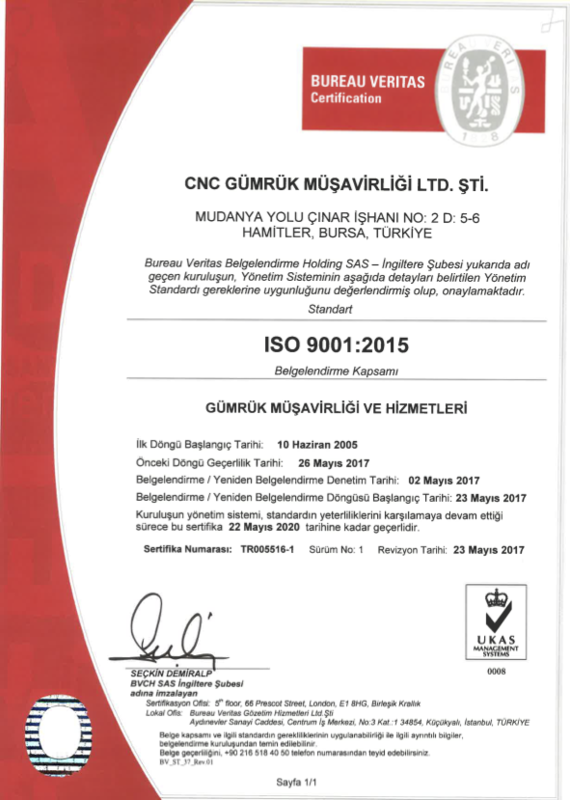 As a result of the Certification Audit carried out by the CNC Customs Brokerage BVQI certification body, it was found that the Quality Management System fulfilled all the requirements of ISO 9001: 2015 standards and BVQI-UKAS Accreditation Certificates were approved (CUSTOMS CERTIFICATION AND SERVICES) and BVQI Quality Management System Certificate was given. In addition to the institutionalism that has been gained with the Quality Management System Certificate, it has created an organizational structure that thinks and analyzes for the customer, creates a win-win strategy by customer satisfaction, effectively deals with customer complaints and removes conflicts. Today’s goal of CNC is to continue its investments in technological infrastructure and human resources and to maintain its satisfaction-oriented service given to its customers without sacrificing its understanding of continuous improvement.